Leaving the hostel at 7.30am, we had until 2pm to get to the pier for the once a day boat to Koh Rong. Plenty of time right? Wrong. Since being in Asia, we grasped pretty quickly that pick ups are always late, travelling time is always at least an hour longer due to poor roads and things rarely leave on time - oh, this boat was the only thing to leave on time in the nearly four weeks we've been here. So, when we eventually made it to Sihanoukville we had around 55 minutes to get boat tickets, find an ATM (there are no ATM's, shops, even roads on Koh Rong island) and get to the pier. The tuk tuk driver managed to take us to, not one but two, closed ticket offices so Vicky had to run up the street to buy tickets - guess what, he had also taken us to the wrong pier! The right pier? 15km away from this pier and tuk Tuks aren't the quickest mode of transport where hills are involved. It felt like something out of a film - Vicky hopped in, we shouted to the driver to put his foot down and raced across Sihanoukville! A place that was weirdly quiet and also somewhere we had been told to avoid?! (I think people like putting worry in backpackers even when places are okay to visit). We made it to the pier with two minutes (literally!) to spare and were happy to bump into the others from our last two hostels! We had a lovely, slightly choppy, two hour boat ride to take us to Koh Rong. 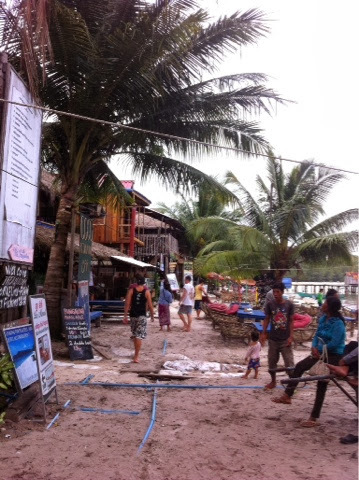 We had been told by numerous people 'you MUST visit Koh Rong!' So we listened and we did. We arrived to a tiny pier and a tiny beach front. We already knew this place was basic and only had power from around 6pm for 5 or 6 hours so we were quite excited for a sense of 'Island life' and back to basics living for a couple of days. We all rocked up to Bunna's Place, the hostel we had booked on hostelworld which had a 75%+ rating and were...less than enthused by the place. We were greeted by an, erm, interesting bunch of individuals - an Irish girl, two American girls and an English guy - all completely hammered and downing cans of beer after slitting them with a knife. 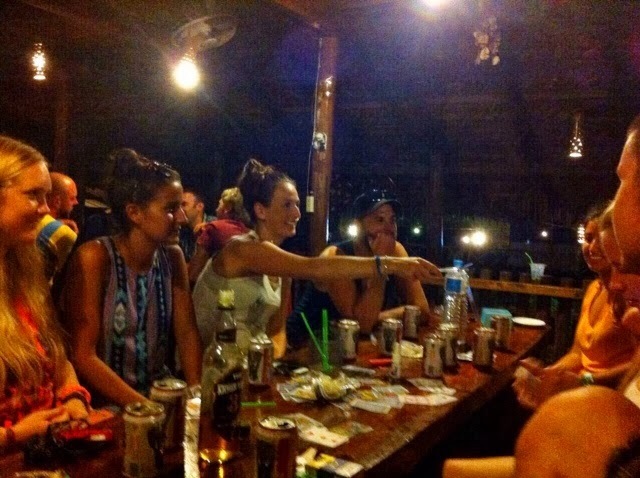 Fine, drinking games, we're all young etc etc but it was 5pm in the afternoon, they were all shouting various offensive words and the place looked like an absolute shithole (the only word to sum it up!) we checked in anyway; we were stuck here now anyway as the next boat was at 8am. We were shown up to our room and, genuinely, if we were an hour closer to shore, I'd have swum back to Sihanoukville. It was dingy (obviously no lights yet but still horrid), smelt like damp and urine, was dirty and although a wooden 'shack' as expected - it may as well have not had any walls at all. But we were stuck here and decided, if you can't beat 'em, join 'em and headed for the nearest bar (away from our 'interesting' hostel residents). We headed down to Coco's bar, which was actually quite nice. The 11 of us ordered food, cocktails, beers and took full advantage of happy hour and 2 for 1. The electricity came on and there was a frantic flurry of travel adapters and iPhones thrust into plug sockets - we were going to be needing our new torch function on iOS7! That evening we drank the night away, played drinking games and forgot about the awful rooms we all had to go back to. We made our way back, torches at hand and somehow managing not to injure ourselves on the ridiculously steep steps up to our shack room. That night, we didn't sleep well. The bed was just snap and horrid, ever movement sounded like somebody was either stood over you or in the room. I swear there were also rats scurrying around and, in general, we were just uneasy. We had been told about something going on on the island by one of the bar staff, something I am not going to speak about..but the next morning, for many reasons, we left the island on the first boat we could get and headed for Sihanoukville. It's safe to say, none of us will ever be ready or want to re-visit Koh Rong. 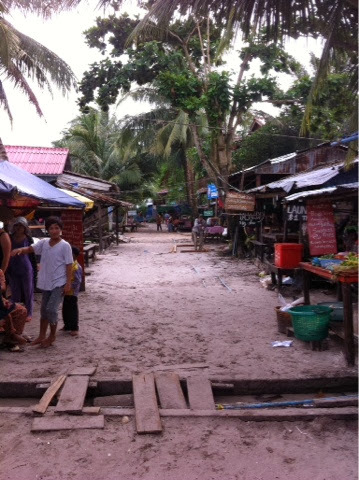 We got to Sihanoukville and all of us found rooms at @home down by the beach for $7 a night (3.50 each - cheapy!) and grabbed a much needed shower. We headed down to the beach, pleased to be in a different environment and got a table of the beach for food, Angkor beers and cocktails. The food was great - barbecued beef steak, jacket potato and salad. We didn't stay up too long, mainly because Vicky had downloaded the first episode of the new series of Homeland. Sad right? But we love it! The next day involved a visa run to the embassy - in Vietnam, you have to get your visa sorted before, either from Bangkok, Cambodia or online. It costs around $60 which is much more money than I anticipated after reading about it online. The bonus of going to the embassy is that we were given our Vietnamese visa within 20 minutes! It couldn't have been easier - our tuk tuk waited outside, we walked in, filled in a form, handed over the form, passports and money and within 20 minutes had the okay to visit Vietnam! We headed back to the hostel to meet the others for breakfast and get down to the beach - the sun was out, the sunbeds were free and I was not missing a tanning opportunity! The weather has been pretty terrible during our visit to Cambodia. Silly really, it is rainy season but you never expect quite so much rain! The afternoon breezed by and it was lovely to get some relaxation in after so much moving around. The only thing, on Serendipity beach - the beach sellers are keen and wear you down. I ended up having my legs and eyebrows threaded (pain! ), bought a bracelet and a 15 year old Cambodian girl made me a friendship bracelet. These girls were sat with us for at least an hour and although they were doing it to make a living and make money from easily persuaded tourists like myself, their English was brilliant and we really got to chat to them properly. That night, the others left for Vietnam (we unfortunately couldn't as the bus was full, which meant an 8am day sleeper bus!) by 8pm the rain was terrible so we headed for the closest restaurant to our hostel - a Mexican a few doors up! Definitely the food I had been craving the most since being here; the veggie burrito I had went down a treat! Vicky and I then headed for a massage. $7 for an hours full body massage was music to our ears and I could have easily paid for a second hour as it was so good! That's one thing you must do while in Asia; make the most of the massages, manicures, pedicures and various other treatments you can have done - they are soo cheap compared to the prices you'd pay at home! Shortly after that (and a cheese fondue and cocktail - yes, bizarre as it sounds), we headed up to bed before another 7.30am pick up to take us to the Cambodia/Vietnam border to make our way to Ho Chi Minh City (aka Siagon). 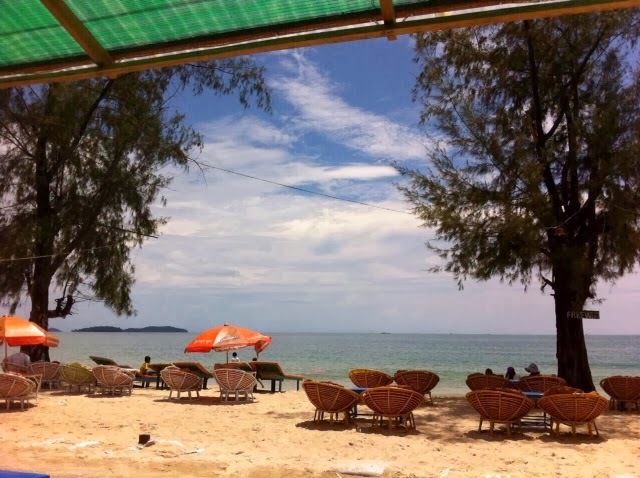 I actually really enjoyed Sihanoukville and wish we could have spent an extra day there instead of in Koh Rong but at least we can say we've been there and I can share my experience with you. It just goes to show, you can't always trust the advice of the travellers you meet - their idea of fun or paradise can be VERY different to your own.